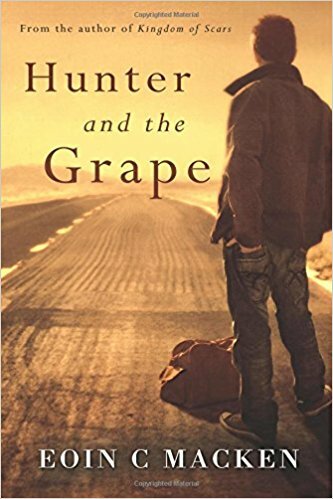 'Hunter and the Grape', Eoin Macken's second novel, released on September 14, 2017, is simultaneously very similar and vastly different than his debut novel, 'Kingdom of Scars'. There are books that take up residence in your soul. They carve out a niche in your heart and mind and settle in, and sometimes that is not comfortable. What they show you about life, others, and most of all yourself is not always easy, but still becomes a cherished part of who you are. Such books I write about immediately, and yet I struggled to write about 'Hunter and the Grape'. At first I figured it was because just days before its release, and my first read through of it, I had experienced an impactful loss in my life, and so expressing emotional response to even a novel was too much while still so raw. That was not it. Actually, I did write my reactions and thoughts the very day I read it, but they are far too visceral to share here, and are only available to the author; only fair since it is my reaction to and because of his work after all. Link to that is in your inbox Sir. When more time had passed, I thought that since I was seeing so many lovely reviews of the book that aptly summarized and described it, I was unable to find my own way of doing the same. Let's get a tad real here. I don't review, as in give my opinion or summarize. No matter what I write about, I tend to detail how the particular work in question affected me. While the raw version is, as stated, not for public consumption, I finally found words for my hopefully more widely relevant and relate-able comments. This book challenged me. Whereas 'Kingdom of Scars' leaped off the page and into my heart, imprinting emotions and psyche, 'Hunter and the Grape' challenged me. Let me be clear. I loved this book. As those who know me or read my blogs and such, may already realize, I can be unwaveringly supportive and appreciative of someone's work and still not feel it all to be equal in caliber. So let me be clear that both of Eoin's novels (thus far) are equally rich in character, in emotive and intuitive sharing of his character's stories and experiences. Trust me - I love this book just as much, it just.... challenged me. Cat, who becomes Hunter, sets out in search of Sophie, this fantasy nymph that he fell fast and furiously for before she took off to California. As I read more about Hunter and his experiences, as I saw him surprise himself as he walked through unexpected emotions with unexpected people, I had to wonder if he was running towards what his heart yearned for, or rather running from what made his heart ache. The thing about intimacy, of any kind, is that it has no processing, it has no cerebral input. Even when not sexual, but particularly when it is, intimacy is simply us fully exposed and open and receiving the same, even if only for a fleeting moment. Hunter's - well Cat at that point - encounter with Sophie took him by surprise and ripped away all over analyzing and decision making. It was the vastly fantastical grabbing him and saying NOW. No shield, no barriers, just experiencing. In moments like that attachments are made that can often feel like something that they are not, but the attachment endures even after undesirable facts and reality set in. He felt desired, seen, appreciated, alive. Not how he usually felt, yet how he - and I'd wager most people - yearn to feel fairly constantly. So off he goes in search of this girl. Sure that it is love. Sure that she saw him and desired him as much as he felt she did. Sure that this attachment was connection at the core level, and must be found and fought for at all costs. As his journey begins, he meets Star who ironically, at least in my observation of their journey, truly became his 'North Star'. She is interesting, annoying, weird, not what he finds attractive. Yet somehow, he is attached, intrigued, and feels a sense of belonging. What he is actually experiencing is being truly seen, accepted, heard, appreciated, and desired. Attachment is actually connection. It surely does not feel that way to Hunter, who feels irriated by Grape's (formerly Star) questions and comments. They hit too close to home, make him think and not just feel, make him look at himself and others fully enough to articulate his responses and not just gloss over them as the moment passes. Grape is quirky with odd and seemingly scattered knowledge and experience. While at times she sounds naive, when you really listen to her, as Hunter finds he must, she has an innate vision and wisdom about people. She sees who they are, feels their pains and their needs - especially Hunter's. Grape's habits and wonderings-aloud, and intrusive questions do more than put him on the spot, they feel claustrophic and he wants to RUN... and run... and just reach the refuge he felt with Sophie, the eutopia he is sure he will find with her once again. I am not sure if Hunter ever sees what I saw, and what I am certain that Grape knew - that he is feeling trapped by himself, by the layers of emotions to so many aspects of his life. His claustrophobia is internal, like drowning from the inside. Like many people, Hunter has moments of fear, anger, regret, and sadness, and loads of hope as he forges forward towards Sophie; his conscious self, ignoring what is becoming clearer and clearer to him on a deeper level. It takes reaching his goal, finding his fantasy, to find out that in truth it makes him feel so much worse about himself than he did even on his own. The things and people we indulge in to avoid our truth, is mind boggling. So often we - like our nomadic young man here - are so afraid to look inside for fear that we cannot handle it, cannot care for it, cannot find where it is truly home. Grape is the opposite and as the saying goes. 'oh how I feel you Girl'!! She knows who and where she must be, when she has changed or is ready to change so much that it warrants a new name, as she steps into her next phase of self. She is seen as awkward, weird, wordy, knows things that she cannot express, and if the world or at least some people would just take it on faith that some things are important even if there is no clear reason why.... oh my what could be! That esoteric, wise yet nearly naive, empathic, intuitive, awkward yet sure in every step, state of being, is not easy. It comes with loads of rejection, the type where you are written off before you are even known. A book judged by a well worn imageless cover. Also a soul that knows, that despite all the delays and detours, where she is headed, whom she is connected to, and what she must do, simply must be - and so she presses on. Relentless. Real. Much like in 'Kingdom of Scars', we see a young man, though Hunter is older than Sam, learning who he is, facing the truth of who others are, facing why he values and yearns for some of the people who treat him the worst, and of course pursuing a girl who is gloss and glitter, nymphatically fantastical and yet so blinded by her own sheen that she never sees him, never appreciates him, and is not home for his soul, nor worthy of his heart. On the journey to find Sophie, Hunter finds himself, his truth. He doesn't have it all figured out, but he feels when he has actually found what he seeks and nothing has ever made him feel more alive than that. Just the impressions these characters made on me - as well as the colorful characters who they met along the way. Nothing here is to say that any of this is how or why they were created by the brilliance of the soul who penned this book. Then again as Paul Auster said, "Everyone reads a different book. That's what's interesting. Everyone sees a different film, as well. We bring our past lives to whatever work of art we're experiencing at that moment, and that's what makes it interesting. It's not mathematics. There are different answers for different people." My more purchase relevant reviews will be up on Amazon and Goodreads soon.